at times we just hear them more clearly. I want to share some of my experiences of kinship with Life as I’ve listened for what Clarissa Pinkola Estes calls ‘the river beneath the river’ — the pulsing sounds within silence and the whispered secrets longing to surface. I call this “yin-listening,” an ability we are all born with but are rarely encouraged to develop. While our culture values mental accomplishments, material success and power, yin-listening is rooted in the vulnerability of an open-hearted, reciprocal intimacy. Ever since a series of personal disasters unraveled my life in 1990, my intuitive listening has drawn me steadily into this deeper river through many conversations with plants, stones, trees, and animal spirits. Before energy manifests as form it lives as a frequency, a vibrating song within a womb of silence. We all have an innate capacity to perceive a far wider range of frequencies than we generally engage but most of us have lost our ability to hear the subtle sounds of the Earth and the voices of all her creatures. This collective deafness reinforces the belief that the Earth is mute. It also compromises our ability to gracefully coordinate with Life on this planet. It is my belief that this quality of intimate listening is essential for wisely navigating the tremendous environmental challenges we are now facing. Rationally, we know stones do not talk; though trees may creak in the wind, we mostly see them as silent sentinels. Meanwhile, Kirlian photography reveals vibrating auras around both living and ‘inanimate’ things and sophisticated devices can detect sound frequencies in plants, stones, and even metals. In other words, science is helping us understand that everything is singing. I think of listening as taking place within a series of concentric circles, activated from the core — the still small voice of our own heart wisdom. When we listen carefully, the still small voice grows steadily louder and clearer. Gradually, our focused yin-listening develops a palpable field of energy within and around us. We can begin to perceive other voices that resonate with our developing heart wisdom by focusing on an animal we love, a significant tree, or a landscape that really calls us. Listening within this larger circle through an open, engaged heart brings us into a dynamic relationship with the inner life of the ‘other’. Our focused desire to listen, without agenda or expectation, magnetically draws out the other’s voice while enriching our own experience. As we develop confidence in this type of deeply receptive listening, we can move our attention to other fields of energy, including situations that challenge us or difficult issues in our personal lives and our environments. Supporting clear listening, Solomon’s Seal helps us receive aural information fully and accurately. Instead of our mistranslating, over-reacting, or putting our own spin on things, the essence helps us entertain a wide range of possibilities within our listening hearts. 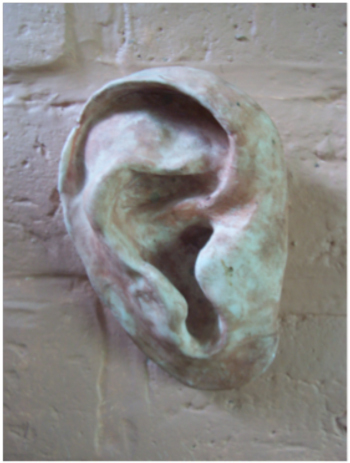 As our listening deepens, we can sense the tone of voice required in any situation. 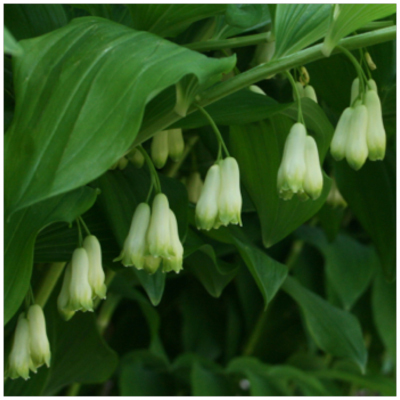 With bell-like resonance, Solomon’s Seal expands the range of our vocal expression by modulating harsh abrasiveness and amplifying the sound of our love and joy. As I write this article, the Solomon’s Seal is blooming everywhere in my garden. It is a signature plant, growing into large swaths of beautiful arching bell-flowers. It is a constant reminder of the importance of listening. I only began to practice yin-listening in my forties. Though I studied many subtle nuances of music as a classical pianist, when I was a child, playing the piano was more about winning at local musical festivals than joyful self-expression. In 1995, I began making flower essences, a process that involves intuitive listening to each flower’s essential nature. I loved the visceral sensation of intimacy as I carefully observed the plants. Softening my mind and opening my heart to perceive their blossoming expression, I heard distinct phrases conveying the essence of their spirits. Though I was focused on creating healing products, I gradually realized this intuitive process was subtly altering me, drawing me steadily into relationship with the Great Mystery. Flower by flower, I gathered Nature’s stories through the plants in my garden. The experience became an intoxicating love affair. Out of my conversation with the Solomon Seal essence the following poem arose, with Gaia’s voice as first person. and I know the ways of change. Do not bargain for relief. That will keep us distant. Walk the pathways of your pain. Close your eyes and let my humming guide you. a sweet elixir greets you. for tenderness begins the change. My focus has now shifted from producing flower essences to helping others learn to listen. Recently I gave a private flower essence tutorial to a young woman, a gifted clairvoyant whose orientation was primarily toward communing with the angelic realms. I explained how this type of listening involved a conscious rootedness into the heart of nature. After leading Danielle through a guided meditation to ground her energy, I invited her to practice drawing up energy through her root chakra before she went out to the garden to locate the flower that called her. “There are two hosta plants,” she said, “in different locations in the garden.” After she put the petals in a bowl of water to begin making the essence, I asked her to take quiet time to commune separately with each of the plants. Later, she shared her experience. Her first conversation yielded a fairly typical flower essence description outlining the hosta’s healing properties, but when she shared the second, I was amazed. This conversation took place in an area of the garden I’d previously identified as the root chakra zone. In this setting, Danielle’s communion with the hosta took on a very transpersonal quality that I recognized as similar to what I feel when I’m in communion with Gaia, the spirit of the earth. Feeling a distinct humming vibration in the earth, she sensed her body was naturally in tune with this frequency. “My song is dancing with the earth’s song.” She also realized she needed to continue consciously tuning into this vibration to feel safe, grounded and fully present in her body. Though I have taught many people how to make flower essences as a way to commune with the plant kingdom, I did not expect a ‘beginner’ to perceive these deeper layers of connection. My own explorations had introduced me first to the individual personalities of the plants but further meditations opened a powerful portal for me, directly into the heart of the earth. As Danielle received information-energy through her root chakra rather than her third eye, she was able to access this different realm of earth-wisdom, accompanied by a rippling sensation throughout her entire body. we have broken the great conversation. And by breaking that conversation we have shattered the universe. how to open the ear of the heart. 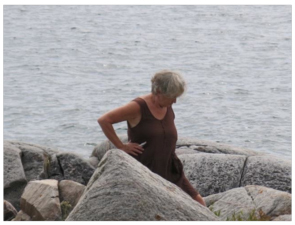 Every summer, my artist friends Ed Bartram and his wife Mary Bromley move up to an island in Georgian Bay where they live for four months in a very beautiful and rustic setting, painting, gardening, and entertaining friends and family. 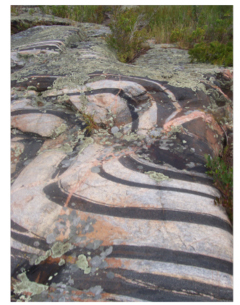 The remarkable striped stones in this area of Ontario are a geologist’s treasure-map, revealing stories about the earth’s formative shifts millions of years ago. I’ve enjoyed visiting Ed and Mary on their island for the past twenty summers. While they paint and tend other projects, I head out with my journal to commune with the ancient stones. Listening in this landscape is very different than in my suburban garden. In my experience, while flowers tend to mirror our human personalities, ancient stones offer us entry into a deeper earth-story. Whenever I visit this island, I feel powerfully connected to the anima mundi, the Soul of the World. It usually takes me several days to settle into coherent resonance with this wild place before I feel sufficiently tuned and ready to receive the slowed wisdom of the stones. Knowing how ancient and articulate this landscape is, when I approached the land in 2013, I paid particular attention when I heard ‘The things that are broken apart are still connected.’ The huge broken stones, split open by ice or major earth upheavals had captured my attention and this phrase became the focus for our annual conversation. Coming down with a painful bladder infection forced me to set aside my plan to listen to the stones; I turned instead to my aching body. This is part of my conversation with my bladder. A blossoming needs to occur through your pelvis. You are designed to be awake and responsive to Life’s multi-dimensional, enlivened frequencies but you need to be present in a completely different way. Three words: Abide, Breathe, Attend will guide you in this different way of being. Applying these three words to your root chakra will broaden your earthed vocabulary and serve your destiny… People tend to want transformation in the form of pain-free miracles, but it is our capacity to willingly bear the anguish that is ours to hold that actually fuels the transformation. When I eventually returned to the broken stones I received information about how the earth listens to us! Gaia always responds with a pure, loving intent to serve and to evolve the whole of Creation. Part of what is broken now is the field of our reciprocal listening, the deep soul-witnessing that is a dance of love between human beings and the sacred pulse within all matter. Remembering this and tuning myself to the Long Song, over and over and over again, has shaped my deepest and most holy connection with Creation. Though there were times in my life when the web ripped open, if I listened, I could still feel the Song shaping delicate new webs. Life’s mystery constantly invited me to open and stand in the new emerging beauty — in the midst of the brokenness. We are living in a time where evidence of the brokenness within the sacred web of life is becoming more painfully apparent each day. I am concerned that our attempts to understand and make amends will be unfulfilled and counterproductive unless we can learn to listen to the Soul of the World. Without this deep communion, we will not understand how to participate in what is unfolding now. In a dream in 2009, I was given a glimpse into the nature of this time as an ‘awful birth’. I’m called down to the shore of an island in northern Ontario by two friends who have just paddled in. Gesturing out to the water, they tell me about a huge creature they’ve seen. As they talk, a whale surfaces out in the bay. It comes straight toward us, arching and cresting through the water, and calmly beaches himself right in front of us on the small sandy shore. Sensing he wants to communicate I run up to the house to get my camera feeling no one will believe me if I don’t record the moment. When I return, the creature is gone. There is a deep and painful aching in the oceans, an amniotic screeching within the watery womb of the planet. It must be heard and released… You are one who has been tuned to bear this awful birth, a birth of such agonizing pain and unknown consequence. At this point in the meditation I broke down, weeping. With more to share, the whale waited for me to regain my calm. We are not asking to be saved. That time is past. We know our immediate future and have accepted it. We present ourselves to you in a pledge, an invitation to work with you in creating a new way, one where our minds and hearts are in complete harmony and communion with you, with humanity. You need us and we need you. The first step is simple: Be with us. Be present. Open and listen — beyond the grief, beyond the shame. Receive us as kin, with information you can attain from no other. Linger with us, for our speech works in your cells in ways of which you have only the glimmer of remembrance. Do not dismiss what you feel in these rarefied encounters for it is the beginning of a new language between us. We need your hearts and brains; you need our ways of knowing. What has been divided – human from animal – must be re-membered. There is little time for this work. I was stunned by the statement that, from the whale’s perspective, we have passed a tipping point where all our best attempts to ‘save’ them is no longer possible. Loss of hope always feels devastating, yet I also heard the whale’s urgent call — to remember our ancient, reciprocal kinship through a new language, apart from the drama of extinction. When we are caught up in high-intensity drama it is easy to panic, become ungrounded, go into over-drive or simply go numb. But when we respond in these ways, we become deaf to the loving wisdom constantly available to us within the natural world. Trusting the wisdom needed for this ‘new language’ would rise from the deep river between our souls, I kept listening through my broken-open heart for ways we might access our ancestral kinship. Instinctively, I knew I must begin by trusting my own animal body. Over the next two years, I began developing ‘Wild Animal Prayers,’ a practice of spontaneous movement and authentic sounding that engages our bodies’ primal wisdom. Though this work may appear similar to other techniques using spontaneous movement and sound, my intention was to access this new language of communion, not just with the animals but with all creation. Gradually I found my way into this ‘common language’ through my soft animal body. Rather than facing real dangers, my Wild Animal Prayers are done in the peaceful quiet of my living room, in my garden, or the open spaces of Georgian Bay. Yet even though the settings are safe, as I move and make my strange, unpredictable sounds, I am often aware of a distinct shift in the quality of atmosphere around me. It is as though a veil opens and I am no longer in ordinary space and time. During one session, a squirrel hung, upside down, on the trunk of the tree outside my living room, completely captivated by my sounds and movements. Only when I stopped after several long minutes later did he scamper away. On Bartram Island, I did a Wild Animal Prayer near a large water snake as he lay shedding his skin in a shrub. As intensely aware of me as I was of him, my own serpentine movements and slow, primal chant created a thick and intensely alive communion between us. We sometimes judge others by saying, “You’re behaving like an animal” but this attitude conveys our ignorance of the tremendous integrity and natural wisdom of creatures. I sense the animals, whales and wolves, raptors and lions are anxious to access our consciousness not only through dreams but through our full body-listening. Allowing our bodies to move in uncensored, instinctual ways while releasing the sounds that want to pour out of us, we begin to loosen our ‘humanness’ and open to the ‘other’. Each Wild Animal Prayer dropped me into the earthy depths of my body-soul where I often stood, quivering on the edge of the Great Mystery. It was very powerful to be witnessed by a colleague or a small group of women during the movement and sounding, for I was both intensely focused and utterly vulnerable. Coming out of the work, I sometimes felt incredibly exposed and shy; it was helpful to witness the changes in my expression in a small mirror. I have joked about how the Wild Animal Prayers are an anti-aging activity for invariably I look at least ten years younger, more open and alive after five minutes of focused movement and sounding. I love holding space for others as they enter a Wild Animal Prayer. I hold space and wait, listening for the buried sounds to be released as the frozen, forgotten zones of her body begin to melt and flow. Whenever a woman lets out a whimpers or a growl, a soaring cry or a stuttering agony, some blocked energy is always liberated in the highly-charged atmosphere in the room. Deepening into the work, I began to experience a potently embodied kinship with creation, richer and more viscerally engaged than my previous encounters with nature. In a strange yet tangible way at times I sensed I was tracking ancient songlines through the earth of my own body, perhaps like aboriginal peoples perceive and respond to their landscapes. Danielle’s discovery in my garden that her song was dancing with the earth’s song echoes Bruce Chatwin’s insight, “The song and the land are one.” Though this song has been long abandoned, it still hums within and between all of us — human beings, animals and the earth. Near the end of a lovely holiday in 2014, I communed again with the spirit of the island in Georgian Bay and received a clear message about my life-purpose. You do not need this setting any longer to take you to the ancient depths. The way is open now in your own body-soul. This island has mothered you. 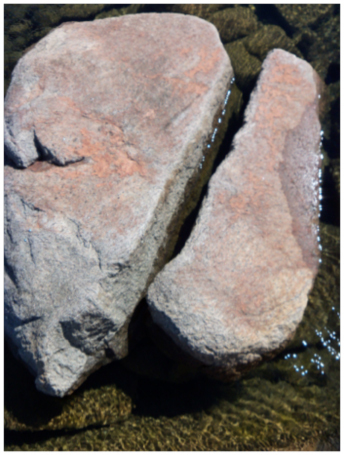 These rocks and waters have healed and repaired parts of your psyche. That healing is done. Now you walk with the teachings of reconnection alive in you. Anywhere you go, you can enter, if you choose, the spirit of the landscape and listen to its soul. Often you will hear aching and longing, a desire to be seen and heard. You may sense broken story-lines and many wounds of ignorance, abuse, or neglect. Repairing each of these is NOT your work! You are meant to tune the listener to the land. That is enough for this lifetime! Let others assume their responsibility as they begin to listen. Though I’d already been hosting workshops and retreats to assist people in communing with the anima mundi, the Soul of the World, I was inspired by this message to carefully examine the intuitive listening process I’d experienced over the years to create a reciprocal relationship with Nature. There are several simple yet vital steps that help to re-establish our instinctual kinship and respectful etiquette with the Earth. The first step is to allow yourself to be magnetically attracted to something in the natural world. Take time to be fully present in your body through meditation, deep breathing and slow, spontaneous movement, preferably in silence rather than with music. When you have consciously engaged your body, move outdoors and trust your feet to guide you. Walk slowly, allowing yourself to feel as though something in Nature is gently pulling in a particular direction. You may find yourself in a familiar place or somewhere new and unexplored. Though you might anticipate being attracted to a particular tree, when you get there, it could be the stone at the base of the tree that is actually calling your attention. The second step is to closely observe what has called you – an animal, clouds in the sky, a flower, a body of water. For the purposes of this exercise, I will refer to trees… Gradually let yourself come into relationship with the tree’s ‘otherness’ by honouring and observing the details of its physical presence. Look with your heart’s eye, not just your usual vision, like a child who sees the world with a sense of complete awe and wonder before learning the names of things. You may have walked past this tree hundreds of times but never really paused and observed it closely. Take slowed time to really look at its body — the bark, the patterns of the branches against the sky, the play of light through spaces between the veins on the leaves as you let the tree pull you, slowly and quietly, through its physicality into a relationship with its soul. The next step is coming into deep, respectful resonance. Let your breathing synchronize with the tree as you allow yourself to feel the tree’s energy in your body. Everyone’s experience of resonance is different. Over time, our bodies become more sensitively enlivened by our conscious contact with the elements of the natural world. Be aware of any subtle sensations occurring in your body: a slight tingling, a slow, sinking sensation throughout your torso or rippling looseness through your back could indicate that you are beginning to receive the tree’s energy and vibratory information. Try not to edit any of these subtle sensations. Trust your intuition, and continue opening your receptive body to receive the inaudible frequencies. When we doubt ourselves, our fragile heart-connection with Nature tends to wobble, closing the door to deeper intimacy. Staying present and attentive, we gradually become more comfortable and familiar with nature’s language of subtle sensation. This is the foundation of true kinship: our willingness to be fully present and radically receptive. The third step involves listening. Only when we have closely observed the tree and allowed ourselves to experience resonance are we are ready to hear the tree’s ‘language’ on its terms. As a harmonious atmosphere is established, information-energy begins moving back and forth between you and the tree in a fluid reciprocity. It is vital to set aside our personal agendas, assumptions and prejudices otherwise we are just talking with ourselves. Our task is simply to be open to receive. Posing an open-ended question to the tree such as, “Do you have a message for me?” is a good way to begin the conversation. As you listen, you may experience various physical sensations. An image may come to you — strong and clear or subtle and fleeting. You may hear a simple phrase or have a significant memory. Pay close attention to all the impressions, letting the experience unfold naturally until it feels complete. Then be careful not to immediately interpret your experience as this tends to break the fragile rapport. Simply receive and notice the effects of the tree’s presence in your body-soul and when the process feels complete, express your gratitude to the tree. Later, record your experience with as much detail as possible, holding it quietly in your heart-space to integrate within you. Containing and gestating these numinous experiences is important. Though it may be tempting to share your revelations with a friend, casually chatting about these experiences before they are fully integrated can dilute and distort what is germinating within you. After listening, the information needs to be embodied. It may take considerable time to embrace and grow into the fullness of the messages you receive from the natural world. I am still attempting to integrate a message I received twenty years ago, ‘Teach like a tree and talk like a stone!’ Each person’s way of listening is unique. How the tree communicates with you may be different with the way it communicates with another person. How the tree communicates with your intuition and imagination may vary with each encounter. We are remembering, at a cellular level, a living language we have long forgotten. I have found Nature tends to speak in poetic metaphors and with a tremendous kindliness. If you hear messages that sound like a harsh teacher or a flaky guru, you may need to get more grounded and centered before proceeding. As you become more familiar with these exchanges, you will begin to recognize a certain tone and distinct energy that is characteristic of your unique relationship with Nature. Magnetic yin-listening strengthens our heart-energy and invites hidden or buried parts of our soul to emerge. Observing people as they share their encounters with some element of the natural world, there is usually a beautiful blossoming in their expression. As we learn to listen and feel the Soul of the World in our body-soul, parts of ourselves that were lost or abandoned begin to be gently resurrected. Witnessing each person’s communion with Nature is vital. As people share their stories in a safe, non-judgmental space, confidence in their embodied intuition strengthens. Listening open-heartedly, we honour these liminal moments together, grounding our experiences and making them more real. While sustaining a quality of intimate kinship in our conversations with each other, we deepen our relations with all of Gaia’s creatures and kingdoms. In these simple ways, we create sanctuary, for ourselves and for the Soul of the World.